Sadly, I only got there once this year, same as last year. This year's milkshake: 70% cacao with orange, which is yummy. My goal for next year is to try and compare at least 20 of the 40. The fun thing about the place is that it's Swiss chocolate in the front, Swiss timepieces in the back, including a bunch of truly awesome grandfather clocks. 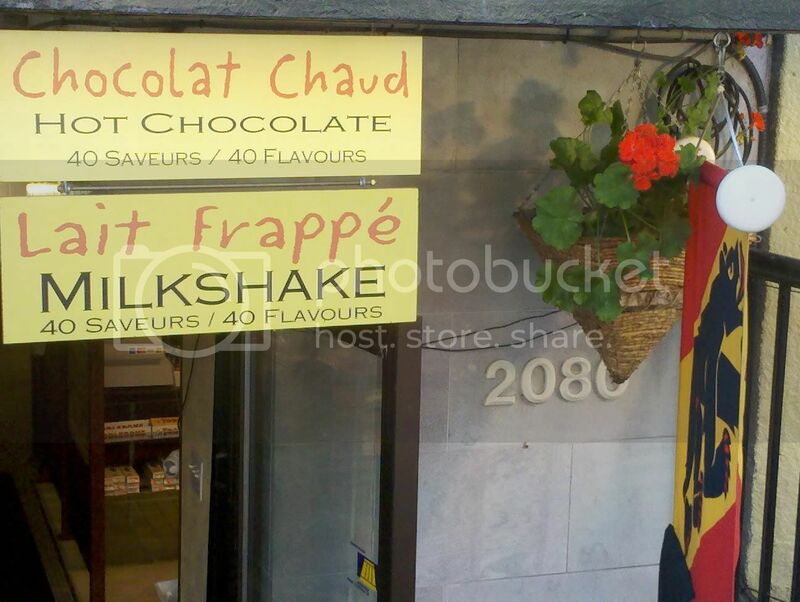 A part of me wonders if those are the owners' true passion, but the chocolate provides day-to-day operating capital in between selling $2,000 clocks. And so, we reach the end of the pre-screener portion of the Fantasia coverage. My last day at the festival is usually less about seeing movies than housekeeping, and this year was no exception: I walked down Maisoneuve to have construction pancakes at Eggspectation, did some laundry (I had money on the card anyway), put in my time at the day job, waited to return the keys to the apartment, took the Metro to the bus station, stowed my luggage, came back for my last show, and then headed back to the bus station. Ah, the bus. As much fun as it is to actually put something into a locker at a bus station - if I'm ever found wandering a strange street with amnesia, I darn well want a mysterious bus station locker key in my pocket! - they tend to be crowded, with long lines that blend into each other and ticketing systems that can be charmingly quaint reminders of a bygone era. It was especially crowded that day, so they had to put a second bus on, and I was lucky enough to have the cutoff be just in front of me. It doesn't sound like a big deal, but the second bus was significantly less crowded, meaning I could recline my seat without being in someone else's lap, use the power outlet without negotiating, and move about a bit when I slept after the border (which was relatively painless! I half think I made the officer's day in that "sublet an apartment I found on Craigslist" was an answer he hadn't heard before). Before that, though, was one last show - "Voltaire: Puppet Master of the Macabre". Fans may laugh, but I was kind of expecting some actual puppetry. Instead, there were a couple of reels of the work he did as a stop-motion animator, a viewing of his 16mm copy of the Oscar-winning short "Balance", and some entertaining storytelling before he broke out the guitar and started in with his quirky, goth-inspired folk songs. I get the feeling that the initial response to the show wasn't quite what the organizers had hoped for; in the days leading up to it, the volunteers were handing out a lot of postcards to people waiting in line, eventually with a "buy one, get one free" sticky note attached. It was a good show but perhaps a tough sell, as it was three different things, came at the end of a long festival, and despite the French name, everything was in English. It was also scheduled at about the same time as another multimedia show and the Fantastique Weekend shorts programs. I was sitting close to the back so that the fans could get closer, so this picture doesn't really show the contrast between the evil-looking album-art photo and the gregarious raconteur on stage. It's kind of amusing to me that Amazon puts his albums in the "Metal/Industrial" category, considering that he's probably now best known for doing songs for the Grim & Mandy cartoon, and the live show was folk-y, which is just about the opposite of metal in terms of tone. Of course, since this is my only exposure to the guy, he could just be a chameleon - doing some recordings and shows with tons of distortion and backup, but going acoustic on others, even if it's the same songs. I think this was during "When You're Evil", one of his more popular songs. I may be wrong, though. Anyway, plenty of people seemed to know the words. So that's the last day (for me; there were two more days of shows, but they were mostly repeats and French-language shorts). 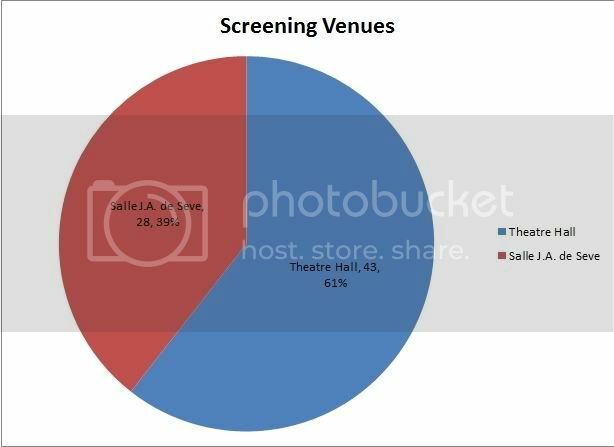 Now, as with IFFBoston earlier this year, let's wrap things up the way only a database programmer who spends the better part of a month in a different cities watching movies would: With graphs! I'm only including the films here, so the Voltaire show in Theatre DB Clarke is not shown. This isn't anything close to a big deal like it was for IFFBoston; both rooms are comfortable and getting from one to another just means crossing the street. To a certain extent, it's indicative of how much of what I saw was the stuff expected to draw the larger crowd, I guess, but that's really it. "International" here is DJ XL5's Rockin' Zappin' Party, which was mostly American and Canadian content, but not entirely. For a genre film festival, this isn't a particularly surprising list - Japan not only produces a lot of material, but enthusiastically exports it (several of its entries are Sushi Typhoon films half-built for the international market, or ones made with similar goals). South Korea cranks out a lot of great stuff these days. The relatively low numbers for the Chinas may be deceptive - I had already seen True Legend and wound up taking a screener for Ocean Heaven home. Still, the lack of anything out of the People's Republic is somewhat surprising (caveat: they were probably involved in Hong Kong's three entries). Biggest shock is the very low score for Thailand; there was no Thai horror this year, no quirky comedy/dramas, and just Bangkok Knockout for martial arts. Halves are awarded somewhat haphazardly - the description for Art/Crime indicated that it was a combination of English and French, so I went with that, although I remember much more French with English. I called Ip Man: The Legend is Born half-Cantonese and half-Mandarin and treated both Don't Go Breaking My Heart and Detective Dee as all-Cantonese, although I'm really sort of guessing there. English dominates, roughly equaling the totals of the next four languages combined (or exactly, if you give the half-film to French), with about 43% of all films I saw, and it could have been much higher; I saw several English-language features that I would have seen at Fantasia at other festivals. The somewhat sad thing is that these films don't just come from English-language countries - Urban Explorer had its international cast using English as a common language (hence, Germany appears in the country list while German is absent from the languages), while Blackthorn was made in Bolivia by Spanish filmmakers (and money), so we'll call it Spanish. That's not really new; Spain has been cranking out English-language films for the last decade or so. And then there's The Devil's Double, which is apparently Belgian in origin. Good luck finding anything even vaguely Belgian about it, from its English star, French co-star, Iraqi setting, Kiwi director, and English-language dialogue. 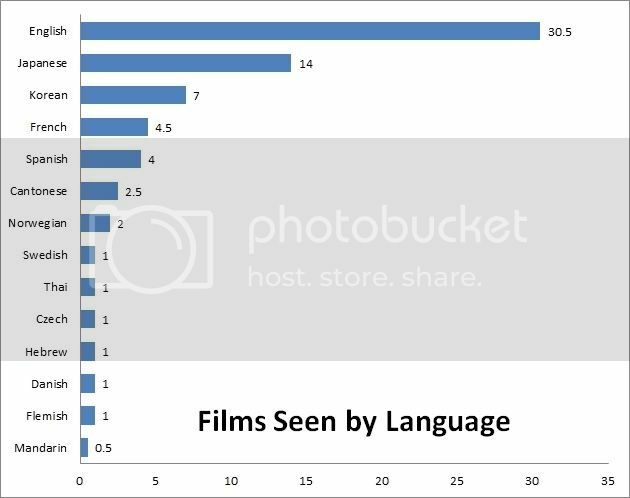 It does make Belgium an interesting entry in the previous chart, in that its three films each had different primary languages: Bullhead was mainly Flemish (though with some characters who spoke French), Please Kill Me was mainly French (with English-speaking characters), and The Devil's Double. I'm not sure which view I like more, so here's both. 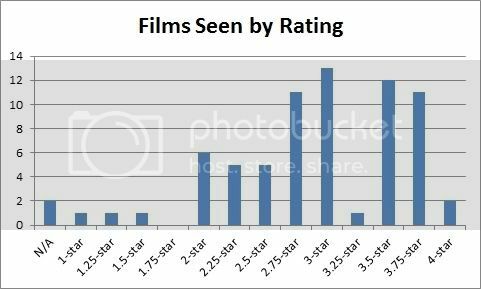 The bar graph shows a bell curve; the pie chart makes it easier to see how much of what I liked was in a certain range. The N/As are the Zappin' Party and Surviving Life (Theory and Practice), where I not only nodded off, but slept through such a large chunk that I couldn't even fake it if I were inclined to. I split the difference between the two ratings I gave Kidnapped (two & three and a half) and called that 2.75. 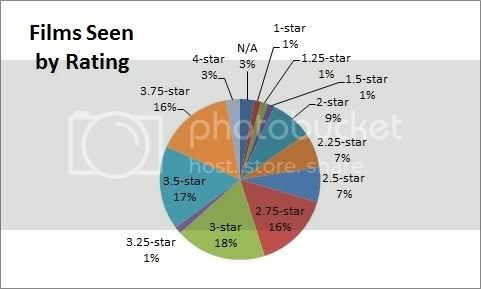 Three stars was not only the mode rating, but also the median and close to the average (which is 2.95 stars, not counting the N/As). That's a solid festival; you'd always like it to be skewed more to the high end, but isn't that true of everything in life? Again, the amount of things I saw at other festivals (and which got theatrical releases in the US) skews it - if I hadn't seen The Corridor at BUFF, that's another three-star film in the books. True Legend was 3.5, etc. In conclusion (well, sort of - I do intend to review the screeners this year), Fantasia is a great festival, and to be totally honest, I kind of don't mind that there are ways in which it extends into September for me. It's generally a bunch of pretty good movies, with a lot of variety. 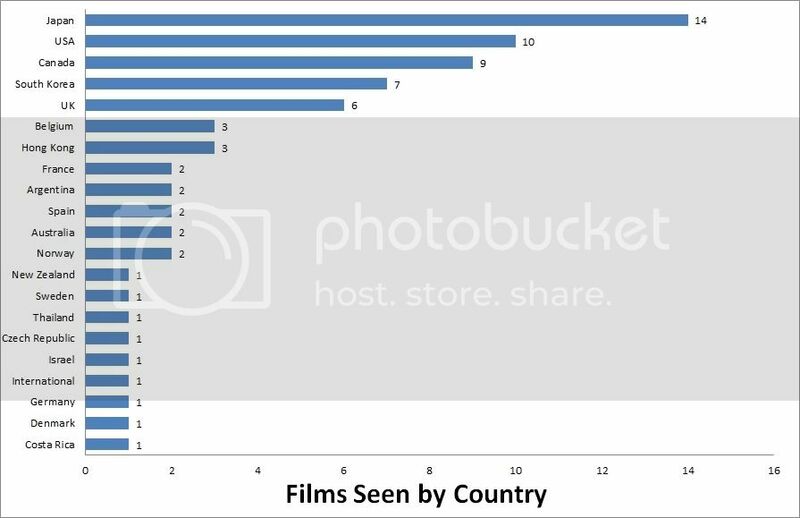 It's even cooler in ways because most of these aren't art-house movies which may not have made any impression on their native audience, but an example of what people in other countries actually like. So, see you next year, Montreal. The next ten months are going to take forever.